Water pumps are the heart of the water systems of countless businesses and apartment complexes in New York City. Your water supply is what's highly important to keep your building and the people who work and live in it able to work and live safely and comfortably. To ensure that your water pump is working smoothly and without issue, you need keep up with your pump maintenance in NYC. Water pumps are quite similar to other piping systems. They are susceptible to developing problems through extensive use over long periods of time. If you happen to notice problems with your water flow, it might be time to take a look at your water pump. As you inspect your water pump, you might notice that it isn't performing its normal duties at your expected standards. If there's an odd noise emitting from the system or water flow is lacking greatly due to a clogged suction valve, it's time to get a professional to look at your pump system. Maintaining a water pump is not an easy task to handle without assistance from an expert. A professional pump company, like NY Pump & Motor Repair, has the knowledge and equipment to handle various pump issues and, through regular maintenance, prevent them re-occurring. As a family-owned and operated pump company, NY Pump & Motor Repair has provided pump maintenance for many satisfied clients in NYC since 1941. We take pride in giving prompt and professional pump maintenance services with high level of customer care. For our team of professional pump specialists, no form of pump maintenance in NYC is too big or small for us to handle. When we come to businesses or apartmenst, we get right to work inspecting your water pump and detecting where the problems are occurring in the system. Of course, you're not going to always know when your water pump will stop working, which is why we provide 24 hour emergency pump services. You shouldn't have to stress yourself out and have your daily schedule disrupted when your water pump acts up. Don't wait til your water pump system problems get worse, our pump experts will be there in no time! 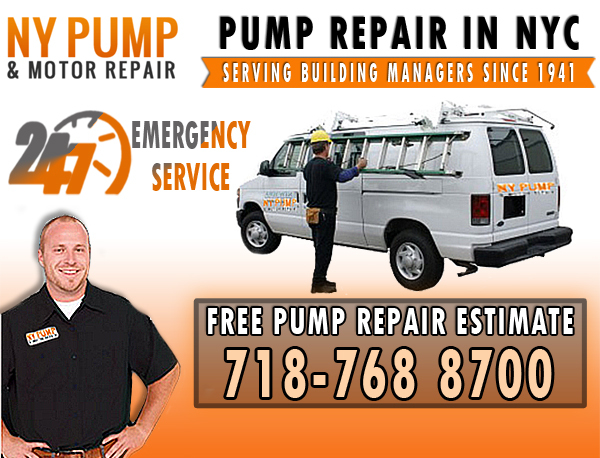 For more information about our pump maintenance in NYC, contact NY Pump & Motor Repair at (718)-768-8700. NY Pump & Motor Repair - Your trusted Pump Maintenance in NYC.